A 13192-EVB serves as the basis to test a piezoelectric vibrating gyroscope-based balancing system. 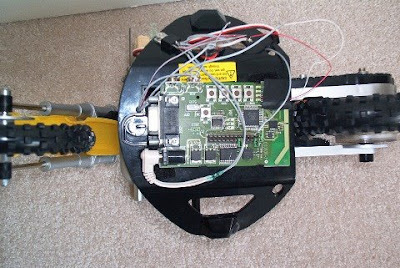 Replacing the original radio controller in a toy motorcycle, the board now drives the remote-controlled unit. The steering control mechanism was replaced with a more precise RC servo. The piezoelectric vibrating gyroscope provides fast turn rate indication for use in stabilizing the cycle while the motorcycle is running. This MC9S08GT60 microcontroller-based project designed by Jay Schroff.